Codeship offers developers a vast array of possibilities when creating a continuous integration and deployment pipeline for their applications. I want to focus today on how to build a solid continuous integration and deployment (CI/CD) pipeline for a PHP Laravel application with Codeship Basic. Our containers will then boot up, run our test suite, and exit. All of the tests should pass with flying colors. With a passing test suite in hand, we’ll be able to move on to translating our setup for Codeship. With a local instance of our Dockerized application set up, we now can start creating our Codeship build and deployment process. First, we’ll log into Codeship, navigate to the Projects tab, and create a new project. We’ll then select our method of Source Control (GitHub, Bitbucket, GitLab) and point Codeship toward our application. After our application connects, we’ll be presented with the option of making our project a Codeship Pro or Codeship Basic project. For this example, we’ll be running with Codeship Basic. Next up is the formulation of Setup Commands. Our setup for PHP Laravel applications is formulated almost somewhat as if we were configuring our application locally without Docker. psql -c "CREATE DATABASE codeship_test"
This command is very similar to the one that we ran within our Docker container in the local setup step. Finally, we’ll navigate over to the Environment tab and set a few variables for our project. Setting these variables gives a few important pieces of information to our Codeship application. These environmental variables help our Laravel app properly link to our database. With our Codeship CI pipeline in place, we can now save our setup steps and move on to testing out the configuration! We can trigger a new build by committing new changes to your local project. git commit -m "my first codeship build"
This sequence of commands should trigger our Codeship build pipeline and yield a successful build on Codeship. With our passing Codeship build, we’ll now set up the Heroku deployment step in our pipeline. In our Codeship Project page, we’ll select Project Settings and click on the Deploy tab. This will allow Codeship to communicate and push to Heroku if our test suite passes. With the API key copied, navigate to the Deploy tab under project settings. Find the Heroku tile and click on it. You’ll then be asked for your application name (as in what it’s named on Heroku) and your API key. Fill out those fields and click Create Deployment. 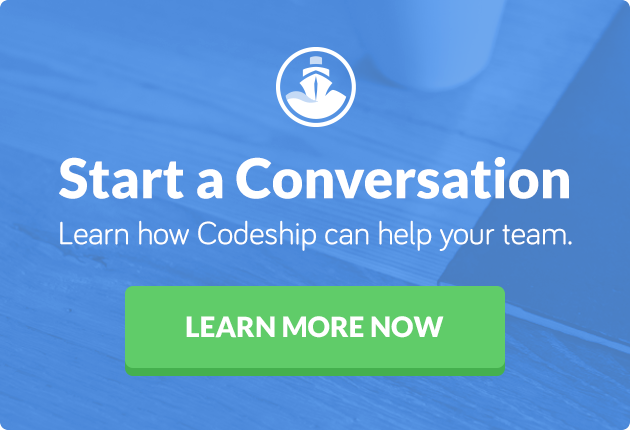 Download and configure your project on Codeship. If configuration is successful, run tests on project. If tests pass, deploy the application to Heroku. Once this process fully completes without any errors, you then will have a successful Codeship CI/CD pipeline! With a rock-solid testing and deployment pipeline in place, we can now rapidly develop and deploy in record time. While Codeship Basic is incredibly effective for accomplishing this, Codeship Pro offers even more possibilities and potential for our processes.